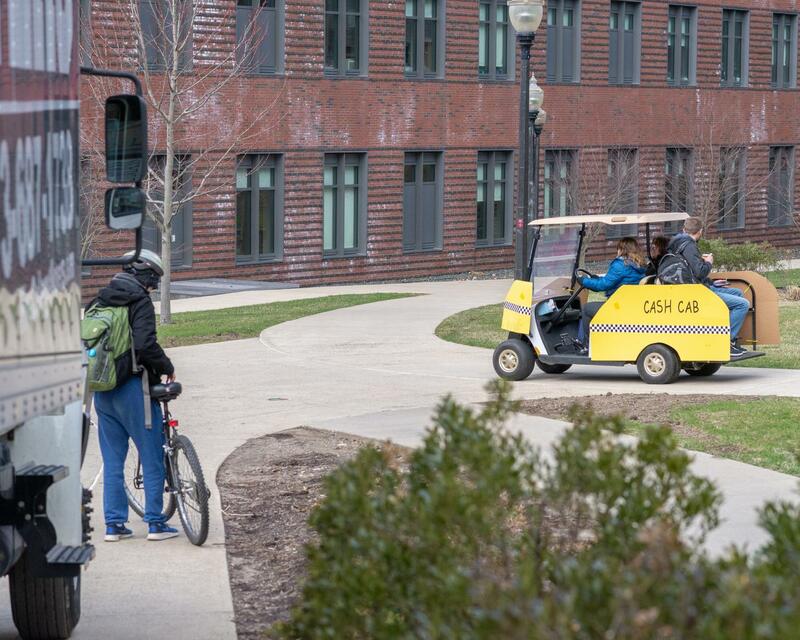 On the brisk morning and early afternoon of April 10, students at the University of Massachusetts had the opportunity to ride across campus for free alongside notable special guests, win prizes and expand their financial literacy skills by answering trivia in the Cash Cab. Based on the game show of the same name, the cab shuttled students to and from class, work or back home in one of two suited up golf carts designed to resemble taxi cabs. As the carts zipped around UMass, student participants who hopped aboard had the chance to be accompanied by one of four special guests: Chancellor Kumble Subbaswamy, Student Government Association President Timmy Sullivan, UMass Bursar Erin Schadel or the school mascot Sam the Minuteman, according to the event’s webpage. The Cash Cab was organized by students from Smart About Money, including the Associate Program Director Nicole Eidelman, a senior operations management and legal studies double major, and Zach Martins, a SAM peer financial coach and senior OIM major. Both have been involved with SAM for two years. “We’re a student-led financial group. Basically, we’re here as a free resource for all students, but we’re here to support them with any questions that they have,” said Eidelman. Students who took a spin in the Cash Cab were asked a series of questions including what an ideal credit score is and the difference between a subsidized and an unsubsidized loan, according to the organizers. Unlike the game show version, SAM’s Cash Cab did not have a three-strike policy to kick riders out for wrong answers. “Especially if we can educate [students] too, just on their way to class, that’s a huge win we think for us and for them,” Eidelman added. Every participant, in addition to gaining a free ride, walked away with a SAM reusable tumbler filled with candy and the answers to the trivia questions they were asked. Eidelman explained that this memento allows students to look back at the correct answers even after the ride, and also provides links to the resources SAM offers. The group usually talks to students about topics such as student loans, budgeting, banking, investing and all things related to credit, including credit cards and credit scores, according to Martins. “Students really come to us with any type of question, and if we don’t know the answer right away, we get right back to them and do some research ourselves,” he added. Martins recommended students not be afraid to reach out to SAM and to start thinking about their financial futures outside of college while still in it. “Just trying to think about the future is definitely important now,” he said. For students curious about SAM’s services, Eidelman recommended going to their website to see the group’s hours, scheduling to meet with a peer financial coach or filling out the group’s survey. The SAM organizers said they originally planned on running their fleet of carts on Monday April 8 as well, but had to cancel due to rain. They said that a second round of the Cash Cab is now postponed to Wednesday, April 17. “You’ll be able to catch the Cash Cab again, if you [didn’t] catch it today,” said Eidelman.